The little owl (Athene noctua) is a bird that lives in the temperate and warmer parts of Europe, Asia (east to Korea), and North Africa. It was introduced into Britain at the end of the nineteenth century, and into the South Island of New Zealand in the early twentieth century. This owl is a member of the Strigidae, which contains most species of owl. The other group is the barn owls, Tytonidae. The little owl is a small, mainly nocturnal species. It is found in a range of habitats such as farmland, woodland fringes, steppes and semi-deserts. It is camouflaged, and especially hard to see if the background is wood or stone covered with lichen. It feeds on insects, earthworms, other invertebrates and small vertebrates such as mice and shrews. Males have territories which they defend against intruders. This owl is a cavity nester and a clutch of about four eggs is laid in spring. The female does the incubation and the male brings food to the nest, first for the female and later for the newly hatched young. As the chicks grow, both parents hunt and bring them food, and the chicks leave the nest at about seven weeks of age. 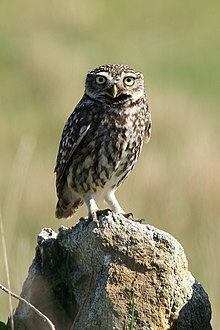 There are thirteen recognized subspecies of little owl spread across Europe and Asia. ↑ BirdLife International (2012). "Athene noctua". IUCN Red List of Threatened Species (IUCN) 2012: e.T22689328A40420964. https://dx.doi.org/10.2305/IUCN.UK.2012-1.RLTS.T22689328A40420964.en. Retrieved 6 November 2015. ↑ König C; Weick F. & Becking J-H. (2008). Owls of the world (2 ed.). A&C Black. ISBN 978-0-7136-6548-2.